Imagine a scenario where a adolescent (14-17) is sick and his condition strongly require a certain medical operation, however the procedure goes against the patient's will. What of the views should prevail? In law, if not ethically, competence to make autonomous decision about one's own body has been considered as a function of age. If this adolescent were a competent adult, his wishes would be crucial on procedural grounds: a competent adult has the right to accept/refuse all treatments, including lifesaving treatments. However, because this adolescent is a minor, determining who is the appropriate decision-maker is a more complex matter. In fact, while the difference between a 5 months old baby and a 16 years old boy is selfevident, the same cannot be said when confronting someone of 18 years-anda- day with someone of 17 years-and-364 days. In the healthcare context adolescent's decision-making competence has been a subject of study both from a theoretical and a legal practical point of view. 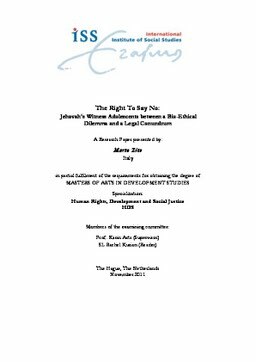 This paper frames adolescents as rights holders in between a right to protection and a right to self-determination. Although a full consensus is missing, there is a legal and bio-ethical perspective that considers adolescents as individuals with potential competence, rather than viewing them simply as incompetent children/minors. This paper choose to deal with this ethical and legal dilemma by focusing on the assessment of the extent to which the general principles of law recognize an adolescent's capacity to consent to and refuse medical treatment in the UK; then, by considering the application of the general principles in the specific court cases concerning Jehovah's Witness adolescents. Jehovah's Witnesses are a religious group that refuse blood transfusion on the basis of religious beliefs. However, protecting the right to express and live a religious identity clashes with the duty and responsibility to protect minors from abuse and neglect since blood transfusions remain a potentially life-saving treatment. The study will focus on the question whether these teenagers have the possibility to refuse life-saving treatments on the base of specific religious beliefs. It will be shown how children who are capable of forming their own autonomous views, based on good information and a certain level of maturity, may have a legitimate right to see those views respected. However, this may not be the approach that English courts followed when competent children were concerned. In fact, in the context of refusal of medical treatments, respect for autonomy and decision-making capacity tend to be trampled by the idea that children should receive the medical treatments if highly recommended, even if the child is strongly against such treatments and even if his/her wishes are based on potentially serious reasons such as religious beliefs. Although the courts' intent is noble, the English current approach does not give the due importance to the adolescent's right to self-determination and autonomy, sustained by a part of the academic world and guaranteed by both international and domestic legal standards.